Arn’s life was turned upside down when Cambodia was taken over the Khmer Rouge in 1975. The Khmer Rouge stripped cambodians of their rights and freedom and forced everybody into labor camps. The dark brown box represents Arn’s time in the woods when he was filled with darkness and monkeys. The dark green background represents his time farming rice in the rural countryside of Cambodia. you will see in my shadow box with three pictures. 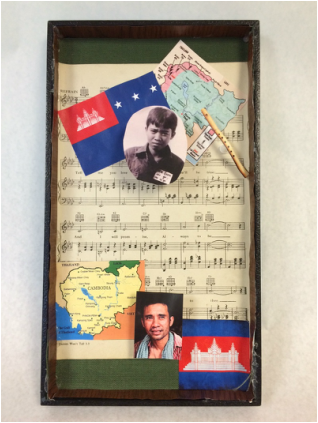 A Khmer Rouge flag, a picture of a young Cambodian boy, a map and a flute. The flag symbolizes how the Khmer Rouge taking over Cambodia and completely changing everybody’s lives. The map symbolizes how Arn fought in the war for a short time before fleeing into the jungle to escape the Khmer Rouge and the war. The city Battambang was the second largest city and was where Arn was living in at the time. The young Cambodian boy is Arn when he was around 8 years old. The map you will see is the invasion of Thailand when they attacked the Khmer Rouge.. The flute symbolizes his musical ability and his love for Cambodian flute music. The flute also symbolizes how music saved him from being killed by playing for high-ranking officials in the Khmer Rouge. The three pictures in the bottom half of the box are a map of Cambodia, an adult Cambodian man, and a Cambodian flag. The Cambodian map represents the country rebuilding itself and recovering from the devastating event. The Cambodian map also represents recovery after the rule of the Khmer Rouge. The last photo you will see is Arn Chorn Pond as a adult. This photo represents how even though Arn was affected by this genocide he overcame it and dedicated his life to helping others. When the Khmer Rouge came to power in 1975, Arn nearly escaped death by playing music on his flute. When hundreds of children including him were sent to a death camp called Wat Ek in Cambodia, four boys including him were chosen to learn how to play the flute and the Khim. In five days his master taught him how to play both the khim and the flute. Soon after, only Arn and one other boy were kept to entertain the soldiers. The other boys were killed along with the other children. Arn Chorn-Pond was born in Battambang, Cambodia in 1966, right before the Khmer Rouge came to power. Battambang was a lively city filled with music and culture. Music was a big influence in Cambodia during the 60’s and 70’s. Arn was nine years old when the Khmer Rouge came to power. Led by Pol Pot, they took over Cambodia. Pol Pot’s idea of a new country was to exterminate all intellectuals including teachers, businessmen, bankers, doctors, musicians, etc. He also believed that Cambodia should be fully agricultural and demanded four times the output at the time. Then the Communist movement banned all institutions, such as schools, hospitals, and banks. They also destroyed all of Cambodia’s vehicles and machines because they were opposed to technology. Soon the city of Battambang and other cities were evacuated to the countryside where the Khmer Rouge had set up work camps. When Arn arrived he was separated from his family and taken to a camp called Wat Aik, which was a Buddhist temple converted into a death camp. There he learned that everyone was considered equal in this new Cambodia. Everyone was now called comrade, and no one owned anything. there was limited food; everyone was forced to wear black uniforms and had a religion, and everyone worked in the rice fields. The first two weeks of camp for Arn were horrible. Every morning at 5 am, he was sent to the rice fields to work. All day he worked in the hot fields until midnight. Those two weeks the guards of the camp would not feed them because they were not producing enough rice. Children starved to death or were executed for being “too lazy” or being sick. Soon killings of these children happened three to four times a day, and Arn barely stayed alive weighing only about forty pounds. One day while working in the fields an official asked if anyone was able to or willing to play instruments. Arn honestly thought that they were going to kill the people who volunteered, but he didn’t care because he wanted to escape the backbreaking work. Later in his life he realized this choice most likely saved him from being executed or dying from hunger. In the following week, Arn and the four other boys were given a week to learn how to play the new Khmer Rouge songs on the him and the flute. Arn who never before played any instrument, was given an old musician to teach him how to play. During those five days Arn rigorously rehearsed playing with his master, knowing that those who were not chosen would be killed. The old man told Arn while he was practicing that as soon as he was done teaching him, he would be killed because the Khmer Rouge wanted to erase all music from before they came to power. When the fifth day came, Arn and the four boys performed their music. Only Arn and one other boy were chosen to play for the guards, and the other boys and the master were taken away to be killed. In December of 1978, Thailand invaded Cambodia. Arn went from being an entertainer for the guards to a skinny soldier fighting for the Khmer Rouge. All the kids from his camp, including him, were forced to fight in the front lines against the Thais or else they would be shot. That is if they were not killed through starvation. For several months Arn fought with the Khmer Rouge until he escaped into the forests. For several months, Arn, who was twelve years old, lived in the forest by himself, living in the trees and wandering the forests. He compared his time in the jungle to the movie Tarzan. He followed monkeys. He ate whatever they ate, and followed their packs around. He wandered the jungle ending up mostly where he started and soon realized that he was going in circles. One day while women were looking for firewood, they found a boy passed out on the ground. The boy turned out to be Arn, who had passed out from being deprived of food and sleep. The women brought Arn to the camp where he soon would meet his future foster father. “Hello.” For the first time, Arn reached out to somebody, and made a special connection. For the next couple of years they developed a bond, and in 1984 Peter Pond officially adopted Arn. Arn and sixteen other children that Peter Pont adopted were moved to Jefferson, New Hampshire where Peter lived. There Arn went to Northfield Mount High School where he was the first non-white student to ever attend the school. Initially the first couple of months of school for him were rough, and he felt that nobody understood where he came from or that he was mentally dealing with the horrors of the war and genocide. Soon Arn was urged to speak about his story believing that it would help him move on. After he practiced his English for months, he spoke for the first time about his life at his local church. In his mind, Arn never believed that anyone would care because he was used to being around people who were emotionally suppressed. But to his surprise many of the people cried while hearing his story and afterward lined up to give him a hug. After sharing for the first time, Arn felt relieved and soon realized he could move on from his past. Arn graduated from Gould Academy in 1985 and went to Brown University for two years. After two years he dropped out to co found an organization called Children of War. It is an organization dedicated to helping young people to overcome suffering from war traumas and other traumas such as child abuse, poverty, racism, and divorce. Children of War trained a leadership group of 120 young adults who represented 21 countries. More than 100,000 US students from 480 schools benefited this program. In 1992, Arn received a bachelors degree in political science from the Providence College. While in college, Arn devoted his summers from 1986 through 1988 to teaching and assisting those still displaced by war. Also while attending college he found the Southeast Asian Big Brother/Big Sister Association and founded Peace Makers. Peace Makers was a US-based gang intervention program for Southeast Asian youths in Providence. In 1998 Arn founded the Cambodian Living Arts. It is a non-profit organization that works to revive the traditional performing arts in Cambodia by locating former masters or trained professional musicians to reconstruct the music the Khmer Rouge tried to destroy. It is lucky for the world that Arn was able to learn the flute and the Khim in four days.